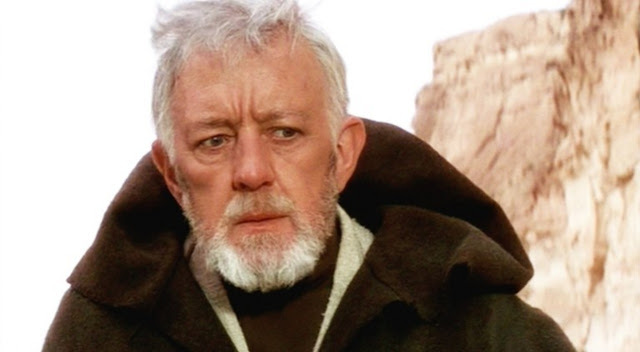 Sir Alec Guinness, CH, CBE was born Alec Guinness de Cuffe today, April 2, in 1914. He was an English actor. 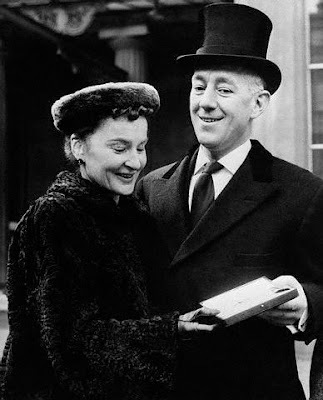 After an early career on the stage, Guinness was featured in several of the Ealing Comedies, including The Ladykillers and Kind Hearts and Coronets in which he played nine different characters. He is also known for his six collaborations with David Lean: Herbert Pocket in Great Expectations (1946), Fagin in Oliver Twist (1948), Col. Nicholson in The Bridge on the River Kwai (1957, for which he won the Academy Award for Best Actor), Prince Faisal in Lawrence of Arabia (1962), General Yevgraf Zhivago in Doctor Zhivago (1965), and Professor Godbole in A Passage to India(1984). He is also known for his portrayal of Obi-Wan Kenobi in George Lucas's original Star Wars trilogy, receiving a nomination for an Academy Award for Best Supporting Actor. Guinness first worked writing advertising copy. His first job in the theatre was on his 20th birthday, while he was still a drama student, in the play Libel, which opened at the old King's Theatre, Hammersmith, and then transferred to the Playhouse, where his status was raised from a walk-on to understudying two lines, and his salary increased to £1 a week. In 1936, Guinness signed on with the Old Vic, where he was cast in a series of classic roles. Guinness served in the Royal Navy Volunteer Reserve in the Second World War, initially as a seaman in 1941, before receiving a commission as a Temporary Sub-lieutenant on April 30, 1942, and a promotion to Temporary Lieutenant the following year. Guinness then commanded a landing craft at the Allied invasion of Sicily, and later ferried supplies and agents to the Yugoslav partisans in the eastern Mediterranean theatre. Guinness won a Tony Award for his Broadway performance as Welsh poet Dylan Thomas in Dylan. He next played the title role in Macbeth opposite Simone Signoret at the Royal Court Theatre in 1966. In 1989, Guinness made his final stage performance at the Comedy Theatre in the West End in A Walk in the Woods. In all, between April 1934 and May 1989, he played 77 parts in the theatre. Guinness's role as Obi-Wan Kenobi in the original Star Wars trilogy, beginning in 1977, brought him worldwide recognition to a new generation, as well as Academy Award and Golden Globe nominations. In letters to his friends, Guinness described the film as "fairy tale rubbish" but the film's sense of moral good – and the studio's doubling of his initial salary offer – appealed to him and he agreed to take the part of Kenobi on the condition that he would not have to do any publicity to promote the film. He negotiated a deal for 2.25 percent of the gross royalties paid to the director, George Lucas, who received one-fifth of the box office takings. This made him very wealthy in his later life. Upon his first viewing of the film, Guinness wrote in his diary, "It's a pretty staggering film as spectacle and technically brilliant. Exciting, very noisy and warm-hearted. The battle scenes at the end go on for five minutes too long, I feel, and some of the dialogue is excruciating and much of it is lost in noise, but it remains a vivid experience." Guinness married the artist, playwright, and actress Merula Sylvia Salmon (1914–2000) in 1938; in 1940, they had a son, Matthew Guinness, who later became an actor. The family lived at Steep Marsh in Hampshire. 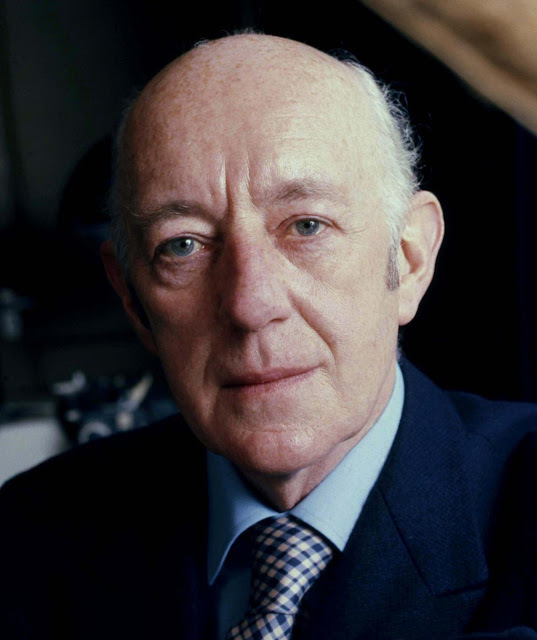 In his biography, Alec Guinness: The Unknown, Garry O'Connor reports that Guinness was arrested and fined 10 guineas (£10.50) for a homosexual act in a public lavatory in Liverpool in 1946. Guinness is said to have avoided publicity by giving his name to police and court as "Herbert Pocket," the name of the character he played in Great Expectations. This was not made known until April 2001, 8 months after his death, when a BBC News article claimed that Guinness was bisexual and that he had kept his sexuality private from the public eye; only his closest friends and family members knew he had sexual relationships with men. Guinness died on the night of August 5, 2000, from liver cancer, at Midhurst in West Sussex. He had been receiving hospital treatment for glaucoma, and had recently also been diagnosed with prostate cancer. Guinness wrote three volumes of a best-selling autobiography, beginning with Blessings in Disguise in 1985, followed by My Name Escapes Me in 1996, and A Positively Final Appearance in 1999. He recorded each of them as an audiobook. I've read the first and third of his auto-biogs which, though very readable are necessarily guardedly self-selective as to revealing aspects of himself. Unsurprisingly, I don't recall anything in them of his bi-sexuality. A far more rounded portrait is actually provided by Piers Paul Read (a close friend of the actor for many years) in the biography requested by Guinness' widow after his death, and contributed to by his son, Matthew, with whom the elder Guinness had an edgy relationship after the boy had grown up (before then it had been warm and loving). This is far more frank around his sexuality and is an exceptionally good read. His disdain for the Star Wars films is well documented, though he did acknowledge the great extent to which it improved his finances. I did see him once on stage, in what turned out to be his final live appearance - in 'A Walk in the Woods', which I caught in Oxford on its national tour. I have several audio tapes of him in plays, including a very curious one-note rendition of the lead in Macbeth, which has always left me mystified as to why he chose to play such an otherwise energetic part in so unexpressive a style. There's no doubt that his very many film appearances will assure his recognition for as long as films exist, and there must be only the tiniest handful of actors, male and female, who could boast, along with him, of having so many top-flight films in their filmography.